Michael James on Money: Do Stocks Become More or Less Risky Over Time? Great post, Michael. There are so many risks out there, it's hard to quantify the concept into a single number (and certainly not volatility). One quibble: "2. The -2or3 investment is expected to beat inflation by 5.8% per year..."
@Potato, I think -2or3 is expected to beat inflation by 0.5% per month and 5.8% per year. Although I'm not sure of the calculation, 0.5% a month compounds to more than 5.8% per year. Ok, my reading comprehension failed. It was flip a coin once a month, not once a year. Thanks Greg. The possibility of losses seems to be confuse a lot of people. A drop following a series of gains can be a loss when measured over a short period, but if you measure the cumulative returns over a long period it becomes increasingly unlikely that such a drop will put you at a loss and it would take an increasingly large drop to actually have a risk of loss. A 20% loss that is preceded by an 80% gain is just "less good" and not really bad news. @Richard: You make a good point about how a short term loss has to me more and more extreme to pull down longer-term gains as they build over time. Investing like an emotionless robot sounds like a good idea. Then you can let your emotions out in most other things you do in life. Hi Michael, good post. Potato is right I think. Volatility doesn't do a very good job characterizing risk. However, because it is convenient and available it gets used all the time (that's what will be the risk indicator for mutual funds). @CanadianInvestor: People already think they know what risk means (in some fuzzy sense). They will substitute this meaning even if we try to explain that we're using a technical definition of risk. Fortunately, over the short term, volatility gives a decent measure of how people think about risk in an every-day sense. However, the technical and every-day meanings diverge when we think long term. Attempts to play around the difference between technical terms, sometimes even jargon and every day meanings happen often in not-so-great media. 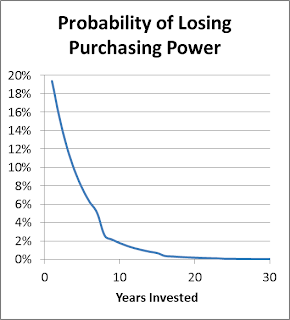 Unpleasantly surprising was to find such technique coming from Harvard prof.
Nice concept, but the analysis on the 1or2 investment is actually incorrect. At an annual volatility of just 1.7%, the value of the put option goes down with longer time horizons if you use the black scholes equation. The call option would obviously increase with time for the reason that its intrinsic value increases over time. @Jin Won Choi: I think we're talking apples and oranges here. I am comparing put options struck at exactly the risk-free rate with variations in the time to maturity. So, if the spot price is $100, and the risk-free rate is 2%, then I'm comparing a 1-year put option struck at $102.00 to a 2-year put option struck at $104.04. Taking this out further, we're comparing this to a 10-year put option struck at $121.90, etc. This is the right comparison for checking the cost of insuring against making less than the risk-free rate. Black-Scholes will have the price of such put options always increasing with increased time to maturity, even for low volatility levels. If you're using the term "loss" to mean returns under the rate of inflation, I agree. But even so, I think your 1or2 example is flawed because it doesn't accurately reflect the bahaviour of stocks. The statistical distribution of stock returns are roughly described by a lognormal distribution, whereas your coinflip example only has binary outcomes, and so has very different statistical properties. You can't measure standard deviation from the 1or2 example and apply it to your 1or2 example. A real stock that returns 1% or 2% above inflation on average, will also have a significant chance of underperforming inflation. @Jin Won Choi: I never claimed that the 1or2 example accurately reflected the nature of stocks. I used it to demonstrate that cases exist where volatility as a measure of risk does not match most people's day-to-day meaning of "risk". What I do claim is that if stocks have any positive expectation of real return, then there is a time period after which the probability of losing money (in real terms) begins to drop. This means that, in an every-day sense, stocks start to become less risky if they are held long enough. My point is that you can't use the 1or2 example to demonstrate that volatility doesn't match people's definition of risk. You've used Zvi Bodie's argument that the option price increases with longer terms. Well, Bodie used Black Scholes, and Black Scholes requires that the underlying assets behave lognormally, which your 1or2 example does not. My point: volatility/standard deviation is fine as a measure of risk in many circumstances. @Jin Won Choi: OK, let's dispense with the examples I chose to make my point more accessible to a broad range of readers. Let's suppose that a particular index of stocks behaves lognormally with expectation above the risk-free rate. If we compute the probability that the stocks will underperform the risk-free rate as a function of time invested, this probability will start at 50% and then decline asymptotically to zero. If instead we compute the probability that the stocks will underperform the risk-free rate by some fixed percentage, like 10%, the probability will start at 0, rise with time invested initially, and then decline asymptotically to zero. I claim that these two probabilities, while not perfect, are a much better measure of the every-day meaning of "risk" than volatility is. To tell a layperson that stocks keep getting riskier the longer you hold them is misleading. OK, I agree with your new example. To be sure, I think you have a point - that's why some people prefer to use Sortino Ratios to calculate investment performance, etc. I agree that risk should only be measured on the downside. But I also do see other point of view. A lot of these financial advisors mislead their clients. Many such clients expect their funds to return 7% per year or something for 30 years. So they think their $10,000 today will grow into $75,000+ and spend their money that way. Well, there's a big band around that $75,000 figure, and missing that target represents risk for them. So yeah, you're right - stocks will return more than bonds almost no matter what in the long run, but it can be "riskier" due to unmanaged expectations. @Jin Won Choi: It's true that there is a big around the expected final portfolio size. My main point is that this band is almost entirely above the risk-free rate. But that doesn't help much if a novice investor has been asked to focus on the expected figure. There are other similar problems with managing expectations. I remember during the tech boom of the late 1990s people talked seriously about being able to retire in a few years as long as they could count on a mere 15% return per year. This sounds ridiculous now, but it was a challenge to convince a group of people that it was unrealistic back then. Yeah, to be honest, I did mistake your point the first time. Good point and great article. So, it's expected that the probability of losing money will approach 1 over time. *from the 1or2 example and apply to real stocks.